Chili is a staple for the winter months, and it’s a staple at Drummond Elementary School when the PTO hosts its annual chili cook-off. 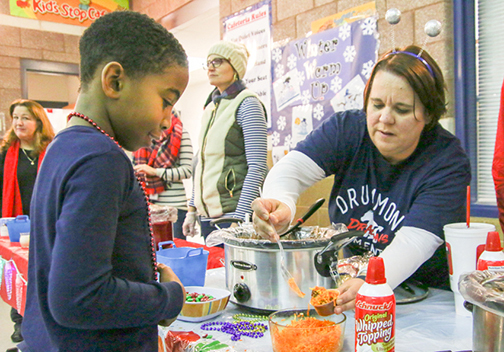 It’s a Drummond tradition: there has been a chili-related event since the school opened 17 years ago, and the chili cook-off has been around for 12 years. The PTO organizes the evening, works at the tables and provides hotdogs and a chili serving line, but it’s up to staff at Drummond to make the chili. Each grade level, as well as groups including counselors, office staff and specials teachers, each have their own booth. 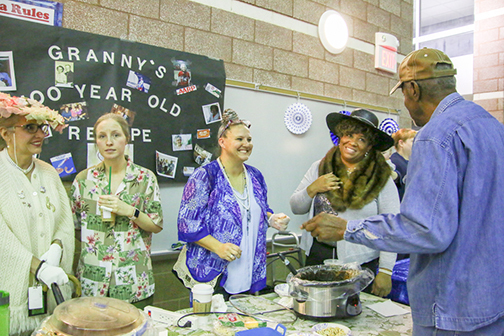 Teachers and staff make the chili, come up with a theme for their booth and work at the booth, handing out samples to students, parents and other attendees. The competition gets pretty fierce. Sometimes the votes come down to the best-tasting chili, and other times it’s all about the show - how creative a booth’s theme is or if the booth has something special. Past booths have included pop culture themes such as Star Wars and Taco Bell hot sauces, as well as the ever-popular Pirate theme, a Hawaiian theme (complete with a teacher playing the ukulele) and a western theme featuring a covered wagon, hay bale and a steer people could ride if they voted for that team’s chili. Winners are announced the day after the cook-off, and the winning team gets a traveling trophy and a gift certificate to spend at the Scholastic Book Fair. This year, the specials team won. A special award called Chief’s Choice was created after St. Ann Police Chief Aaron Jimenez donated funds for 50 people to participate in the chili tasting, and this award went to the fourth-grade teachers. An award for best-decorated booth will be announced at an upcoming PTO meeting. 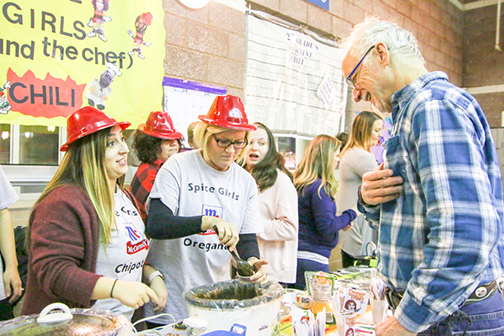 The PTO planned for between 375 and 400 people to attend this year’s event, making the chili cook-off the second biggest school activity of the year (after the Fun Fair at the end of the year). In addition to students, their family and members of the community are invited to attend. Participants can chose to pay just for five sample cups or they can buy a meal deal and get the sample cups, a full cup of chili, hot dogs, chips and a drink. Individual food items are also available for purchase. There are a variety of chilis, from white chicken chili to deer chili to chilis that meet dietary or cultural restrictions like vegetarian chili. This year there was even a dessert chili made of pudding, M&Ms and whipped cream. In addition to being a competition, it’s an opportunity to expose students to things they may not have tried before. It’s also an occasion to build relationships with staff members as well as several St. Ann police officers who attended.